The Spanish Competition Team took the first place in our division for the fourth year! The following students received a Sobresaliente — an outstanding — for their performances! Please congratulate these students on their hard work! Excited to announce that The Master’s Academy has earned the 2018 Ovations Award for “Best Private School” in the Community by the Oviedo-Winter Springs Regional Chamber of Commerce. 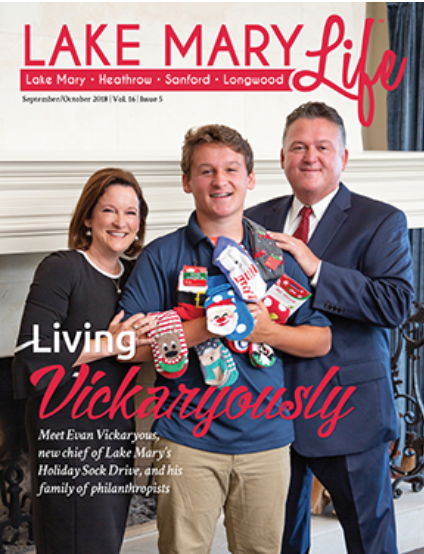 TMA student Evan Vickaryous and his family were featured in a recent Lake Mary Life Magazine for his work running the Annual Holiday Sock Drive fundraiser. Discover how the drive collects new, unused socks and delivers them to Seminole County residents in need. Every year, The Master's Academy administration prayerfully selects a Bible verse to be our theme for the school year. Our theme verse for the 2018/2019 school year is Galatians 5:13 — "Serve One Another"! Congratulations to TMA Students - Applause Awards! Spanish Team Finishes 1st in State Competition! TMA students received 1st place in the State of Florida Spanish Competition for the third consecutive year! Want to find out the latest TMA News?